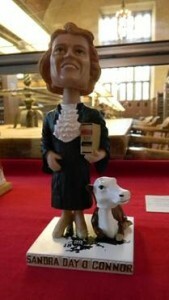 The Law Library is pleased to announce its new exhibit of recently acquired Supreme Court bobbleheads. Created and distributed by The Green Bag, each wobbly Justice is fashioned in the interest of “scholarly artistry,” simply for the fun of it. The bobbleheads, together with explanatory notes, are available for viewing in the Law Library’s Reading Room display cases throughout the spring semester. The Green Bag is a self-described “quarterly journal of short, readable, useful, and sometimes entertaining legal scholarship.” The Law Library thanks Ross E. Davies, Editor in Chief of The Green Bag, for his assistance in building the collection. The Law Library invites you to look at our main display case inside the Reading Room. 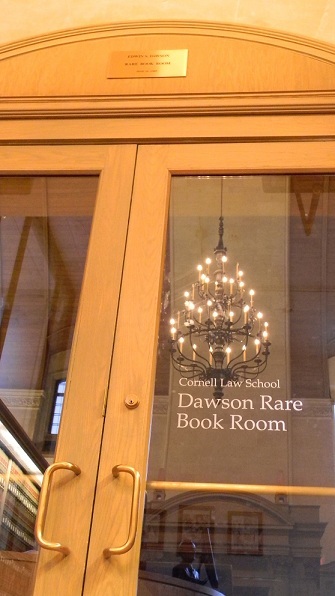 The case shows off, in photos, some of the many Rare Treasures of the Cornell Law Library. The display is presented in anticipation of three open houses at which you can view the actual materials. The Law Library will open the Dawson Rare Book Room at the East end of the Reading Room on February 10th, March 9th, and April 20th from 11 a.m. – 2 p.m. Note that some of these materials may be accessed in digital form here. The Law Library has rich collections of rare materials. The Trials Collection is one of the most popular. It contains pamphlets that report trials involving murder, domestic disputes, and love triangles! The most famous of these trials are those of Lizzie Borden and Edward Rulloff. The Donovan Nuremberg Trial transcripts have attracted scholars from the United States and Europe. A collection unique to the Cornell Law Library is the Laws of Liberia. The library has had requests from law firms, the United Nations, and the Liberian government for this material. Another treasure is The Charter of the Province of Pennsylvania and City of Philadelphia printed and sold by Benjamin Franklin in 1742. Additional materials of importance in Anglo-American law include Coke’s Institutes and Blackstone’s Commentaries. On display in the Rare Book Room is the Scottsboro Train Replica used as an exhibit in the historic 1930’s trial of the “Scottsboro Boys”. It, among other materials, was a gift of the defendants’ attorney, Cornell Law alum Samuel S. Leibowitz, ’15. You can see a portion of this famous model train, an eighteenth-century Blackstone, and a seventeenth-century Littleton in our display case. We invite you to join us at one of our open houses this spring to see more of our riches. 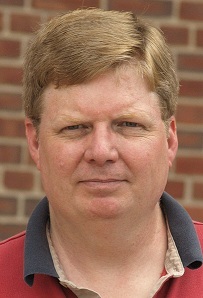 Greg Ewing is the Assistant Director for Faculty & Outreach Services at the Barclay Law Library, Syracuse University College of Law. Prior to coming to Syracuse University in 2000, Greg spent a dozen years working in court and law firm libraries. Greg earned his B.A. in Latin from Carleton College, a Masters in Library Science from the U. of Maryland, and a J.D. from the Syracuse University College of Law. Greg is admitted to practice in New York State. Emily Love received her B.A. and Masters in Library and Information Studies from McGill University. Emily has worked at the CNN political research library in Washington D.C., Concordia University in Montreal and was most recently an outreach librarian at the University of Illinois in Champaign-Urbana. At CNN, she conducted research on federal government web pages and on the 2005 nomination process of the new Supreme Court Chief Justice. 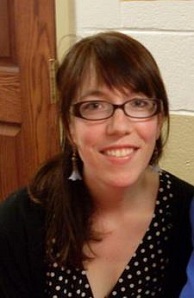 At Illinois, Emily provided outreach and user education programs across campus.